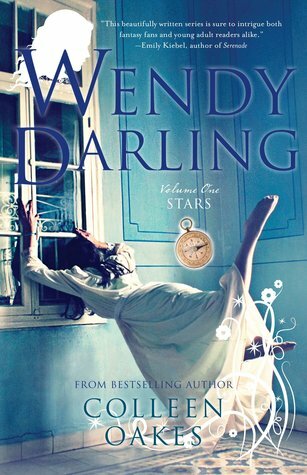 Wendy Darling begins in London, where Wendy, the oldest of the Darling children, finds herself in love with a boy who her parents simply don’t approve of. Oh, they think he’s a nice enough young man, but certainly not a suitable match for a lady of Wendy’s class. And so it is a broken-hearted and disillusioned Wendy who first encounters the magnetic Peter Pan. The journey to Neverland is terrifying in all the best ways – especially as described by Colleen Oakes; she’s a true master. Once there, Wendy and her brothers are pulled in to the unorthodox family of Lost boys and pulled apart from one another. Slowly, through a series of heart-pounding adventures that Peter masterminds, the Darling children find their places in Neverland . . . but have they lost themselves and their lives in London in the process? This is Peter Pan as you’ve never seen him before. Daring and confident, of course, but, in Colleen Oakes’ wildly thrilling and imaginative retelling, Peter is also tempting and dangerously alluring. I cannot wait where she will take us next! FTC Disclosure: I received a free copy of this book from the author in exchange for my honest review. All of the opinions expressed in the review are mine alone.